Chennai, May 12, 2016: TAKE Solutions Ltd. [BSE: 532890 | NSE: TAKE], a globally recognized knowledge intensive technology player operating in the niche domains of Life Sciences (LS) and Supply Chain Management (SCM), today announced an exceptional FY 16 revenue of INR 10,509 Mn., surpassing the 1000 crore mark and achieving a y-o-y growth percent of 42.3%. 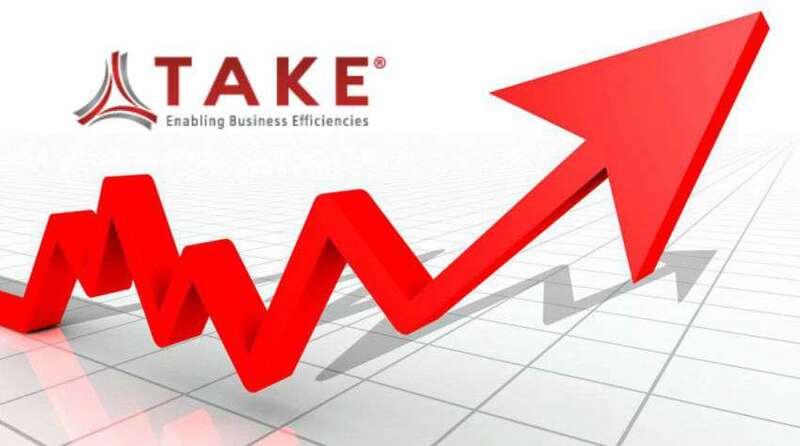 TAKE also reported a net profit of INR 1,197 Mn for FY 16, a phenomenal 71.1% increase over FY 15. Patent win from United States Patent and Trademark Office (USPTO) for our “Method for Optimizing Clinical Data Standardization”. This process leverages TAKE Solutions’ Clinical Accelerators to reduce the time taken to standardize trial data by over 50%. Appointment of new Head of Services, Life Sciences, Shalabh Kumar, who comes with over 20 years of experience in the pharma industry. TAKE Solutions, is a globally recognized knowledge intensive technology player, delivering comprehensive and niche solutions for enterprises across diverse sectors for over 15 years, with key expertise in Life Sciences (LS) and Supply Chain Management (SCM). In the LS domain, TAKE offers IP-based software and extensive knowledge-based solutions to enable efficient clinical, regulatory, safety and content management. In SCM, TAKE’s product suite includes distinct technology with embedded IP that spans enterprise mobility, trading partner collaboration, and material tracking. TAKE encompasses specialized lines of businesses under distinct brands such as Navitas – an IP driven Life Sciences solutions company, Ecron Acunova – a specialized provider of Clinical Services to both Pharma & Biotech companies, Intelent – an expert in Life Sciences Big Data, TAKE Supply Chain & TAKE MEA – flexible, accessible, mobile Supply Chain software solution providers, APA Engineering – an International e-Sourcing and Engineering services company, TAKE Innovations – an incubator to facilitate IP Creation and TAKE Enterprise Services Inc. – a specialist provider of technology-driven business solutions and software services.